If you don’t carry on to read this book and I only have ten minutes of your time, here in brief is what it’s about. Read this, follow this, and you’ll be fine. Write the words at the top of your page. Sit for a few moments in silence and give thanks for your life: for all the people and creatures you love and the land, and for the work you are about to do. Pick up your pen, or use a keyboard, and look at the time. 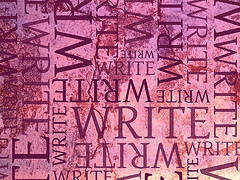 Begin to write and keep writing, without stopping or thinking, for at least ten minutes. It doesn’t matter how you begin your first sentences. During that ten minutes throw in the two words from the top of your page, one at a time or linked, in one sentence or paragraphs apart. However it happens, it happens. At the end of the writing, which must be at least ten minutes, stop and look at the time, note it down. Next day, do the same again. Something will come from this. I once wrote a book, without meaning to, by this very method; by each day taking a breath, saying a blessing and thanks for everything in my life, and selecting two random words to write at the top of the page. I then wrote for ten to twenty minutes without stopping, incorporating those words. Though I had written and published four other novels and over sixty short stories by more conventional means, I decided to write a novel consciously using the method above to see if it could be done. The result – another 250 page manuscript achieved almost effortlessly by ten to twenty minute a day slots, without thinking, over a ten month period. Why the two words? Firstly, the random words acted as a talisman to remind me language is all around me and within me; I am immersed in the tools of my own endeavour and only have to reach for them. Secondly, to use words you have not consciously chosen is like throwing a stone in a pool of water. The words act to stop the flow and track of mind and drop you into the deeper well of the subconscious. When it happens for one sentence, it sets you on a path. And later, another random word jolts and changes the pattern and sends you somewhere else. Those words remind you that you are not in charge. Though you hold the pen and own the paper, and though your mind – educated and aesthetic as it may be – is in charge of what you think, if you drop below that veneer of civilized thought, of thought that must be so, or only knows what it knows, you realize your conscious mind is not everything. It is a band of thought. And below that, and beyond that, is a far greater knowledge and awareness. Your mind is a computer that records from the moment you are born: all the visuals, the sensations, the sounds, the people, the information around you. That data is immense. And that data includes not only what we do as a child, a teenager, an adult, what we felt and thought, but also what the people around us did as well. We have access to different ways of thinking and feeling, to different characters, simply because we are part of the human race and we have grown up surrounded by humans, and by landscapes. To write is not to come only from the conscious mind, which is the you that can recall what you recall. To write is to drop below that to the unconsciousness of all you do not know that you know. And here is where there is no fear. Once you are writing from this level there is no fear because everything you need is within you. The fear comes each time you face the conscious level. Even though you know the deeper level is there. Even though you know how simple it is to get there. Even so, that fear once more casts its shadow. How do you get past it? The shadow of fear only works when you stand in its blackness and let it bar the way. And the quickest way I know to get through it, is to write for ten minutes and to use the two words. What is ten minutes? Anyone can find that time. It can be in the bath, or on the bus, or outside on your break with the world on hold. Ten minutes can be achieved. The second thing: you find two words from a book. You’re two words into your own writing already and you didn’t have to write them. They are your guide posts and your stones. At the top of the page they remind you help is with you, and when you use them they drop you, however briefly, from one level to the next. Here are two words. Shadow. Edge. Thanks Fred. The Power of Now had a big effect on me as well. Appreciating and being in the moment is the best thing you can do for your life and for your writing, I think.